Sunroof, Heated Seats, iPod/MP3 Input, ALL-SEASON TIRES, SIGNATURE TRIM, SIGNATURE UPHOLSTERY PACKAGE. Pepper White exterior and Leather Lounge Satellite Grey interior, Cooper trim. FUEL EFFICIENT 33 MPG Hwy/24 MPG City! CLICK NOW! KEY FEATURES INCLUDE Back-Up Camera, Turbocharged, iPod/MP3 Input Rear Spoiler, MP3 Player, Child Safety Locks, Steering Wheel Controls, Electronic Stability Control. OPTION PACKAGES SIGNATURE TRIM Wheels: 17 x 7.5 Vent Spoke Silver Alloy Style 518, Connected Media System w/6.5 Touchscreen, Transmission: 6-Speed Steptronic Automatic, Heated Front Seats, Automatic Climate Control, Active Driving Assistant, Panoramic Moonroof, Piano Black Interior Surface, MINI Excitement Package, Comfort Access Keyless Entry, SIGNATURE UPHOLSTERY PACKAGE MINI Yours Leather Steering Wheel, Front Sport Seats, ALL-SEASON TIRES. MINI Cooper with Pepper White exterior and Leather Lounge Satellite Grey interior features a 3 Cylinder Engine with 134 HP at 4400 RPM*. BUY FROM AN AWARD WINNING DEALER Bob Smith MINI is one of the premier MINI dealerships in the country. Our commitment to customer service at our MINI dealership serving Los Angeles is second to none. We have a full inventory of new MINI and pre-owned MINI cars, as well as a full inventory of pre-owned vehicles from a variety of makes. Be sure to check our inventory often as we are constantly getting new stock! Bob Smith MINI offers one of the most comprehensive MINI parts and service departments in the automotive industry. Horsepower calculations based on trim engine configuration. Fuel economy calculations based on original manufacturer data for trim engine configuration. Please confirm the accuracy of the included equipment by calling us prior to purchase. Sunroof, Heated Seats, iPod/MP3 Input, ALL-SEASON TIRES, PREMIUM PACKAGE, SIGNATURE TRIM, Back-Up Camera, Turbo. EPA 33 MPG Hwy/24 MPG City! Cooper trim, White Silver metallic exterior and Carbon Black Leatherette interior AND MORE! KEY FEATURES INCLUDE Back-Up Camera, Turbocharged, iPod/MP3 Input. Rear Spoiler, MP3 Player, Child Safety Locks, Steering Wheel Controls, Electronic Stability Control. OPTION PACKAGES SIGNATURE TRIM Wheels: 17 x 7.5 Vent Spoke Silver Alloy Style 518, 6.5 Touchscreen Media System, Transmission: 6-Speed STEPTRONIC Automatic, Heated Front Seats, Automatic Climate Control, Active Driving Assistant, Panoramic Moonroof, Piano Black Interior Surface, MINI Excitement Package, Comfort Access Keyless Entry, PREMIUM PACKAGE harman/kardon Premium Sound System, Auto-Dimming Interior & Exterior Mirrors, Power Front Seats, LED Headlights w/Cornering Lights, LED Fog Lights, Power-Folding Mirrors, SiriusXM Satellite Radio, 1 year All Access subscription, Chrome Line Exterior, ALL-SEASON TIRES. MINI Cooper with White Silver metallic exterior and Carbon Black Leatherette interior features a 3 Cylinder Engine with 134 HP at 4400 RPM*. 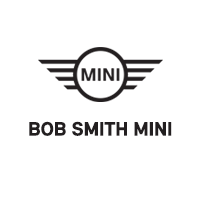 OUR OFFERINGS Bob Smith MINI is one of the premier MINI dealerships in the country. Our commitment to customer service at our MINI dealership serving Los Angeles is second to none. We have a full inventory of new MINI and pre-owned MINI cars, as well as a full inventory of pre-owned vehicles from a variety of makes. Be sure to check our inventory often as we are constantly getting new stock! Bob Smith MINI offers one of the most comprehensive MINI parts and service departments in the automotive industry. Horsepower calculations based on trim engine configuration. Fuel economy calculations based on original manufacturer data for trim engine configuration. Please confirm the accuracy of the included equipment by calling us prior to purchase. Moonroof, Heated Seats, Nav System, Back-Up Camera, iPod/MP3 Input, TOUCHSCREEN NAVIGATION PACKAGE, All Wheel Drive. EPA 32 MPG Hwy/22 MPG City! Cooper trim, Midnight Black metallic exterior and Carbon Black Leatherette interior READ MORE! KEY FEATURES INCLUDE All Wheel Drive, Back-Up Camera, Turbocharged, iPod/MP3 Input. Rear Spoiler, Child Safety Locks, Steering Wheel Controls, Electronic Stability Control, Heated Mirrors. OPTION PACKAGES SIGNATURE TRIM 17 x 7.5 vent spoke silver alloy wheels Style 518, 6.5 touchscreen media system, 8-speed Steptronic automatic transmission, heated front seats, automatic climate control, Active Driving Assistant, panoramic moonroof, piano black interior surface, MINI excitement package, Comfort Access keyless entry, TOUCHSCREEN NAVIGATION PACKAGE remote services, advanced real-time traffic information, Apple CarPlay compatibility, wireless charging, MINI navigation, MINI Connected XL, SPLIT FOLD-DOWN-REAR SEAT, SPACE-SAVER SPARE, ALL-SEASON TIRES. MINI Cooper with Midnight Black metallic exterior and Carbon Black Leatherette interior features a 3 Cylinder Engine with 134 HP at 4400 RPM*. MORE ABOUT US Bob Smith MINI is one of the premier MINI dealerships in the country. Our commitment to customer service at our MINI dealership serving Los Angeles is second to none. We have a full inventory of new MINI and pre-owned MINI cars, as well as a full inventory of pre-owned vehicles from a variety of makes. Be sure to check our inventory often as we are constantly getting new stock! Bob Smith MINI offers one of the most comprehensive MINI parts and service departments in the automotive industry. Horsepower calculations based on trim engine configuration. Fuel economy calculations based on original manufacturer data for trim engine configuration. Please confirm the accuracy of the included equipment by calling us prior to purchase. Heated Seats, Sunroof, iPod/MP3 Input, PREMIUM PACKAGE, UNIVERSAL GARAGE-DOOR OPENER, ALL-SEASON TIRES, Turbo. Pepper White exterior and Carbon Black Leatherette interior, Cooper trim. FUEL EFFICIENT 33 MPG Hwy/24 MPG City! READ MORE! KEY FEATURES INCLUDE Back-Up Camera, Turbocharged, iPod/MP3 Input. Rear Spoiler, MP3 Player, Steering Wheel Controls, Child Safety Locks, Electronic Stability Control. OPTION PACKAGES SIGNATURE TRIM Wheels: 17 x 7.5 Vent Spoke Silver Alloy Style 518, 6.5 Touchscreen Media System, Transmission: 6-Speed Steptronic Automatic, Heated Front Seats, Automatic Climate Control, Active Driving Assistant, Panoramic Moonroof, Piano Black Interior Surface, MINI Excitement Package, Comfort Access Keyless Entry, PREMIUM PACKAGE harman/kardon Premium Sound System, Auto-Dimming Interior & Exterior Mirrors, Power Front Seats, LED Headlights w/Cornering Lights, LED Fog Lights, Power-Folding Mirrors, SiriusXM Satellite Radio, 1 year All Access subscription, Chrome Line Exterior, UNIVERSAL GARAGE-DOOR OPENER, ALL-SEASON TIRES. MINI Cooper with Pepper White exterior and Carbon Black Leatherette interior features a 3 Cylinder Engine with 134 HP at 4400 RPM*. VISIT US TODAY Bob Smith MINI is one of the premier MINI dealerships in the country. Our commitment to customer service at our MINI dealership serving Los Angeles is second to none. We have a full inventory of new MINI and pre-owned MINI cars, as well as a full inventory of pre-owned vehicles from a variety of makes. Be sure to check our inventory often as we are constantly getting new stock! Bob Smith MINI offers one of the most comprehensive MINI parts and service departments in the automotive industry. Horsepower calculations based on trim engine configuration. Fuel economy calculations based on original manufacturer data for trim engine configuration. Please confirm the accuracy of the included equipment by calling us prior to purchase. Sunroof, Heated Seats, UNIVERSAL GARAGE-DOOR OPENER, ICONIC TRIM, Turbo Charged, iPod/MP3 Input. Cooper trim, Pure Burgundy metallic exterior and Lthr Cross Punch Carbon Black interior. FUEL EFFICIENT 33 MPG Hwy/24 MPG City! READ MORE! KEY FEATURES INCLUDE Back-Up Camera, Turbocharged, iPod/MP3 Input. Rear Spoiler, Child Safety Locks, Steering Wheel Controls, Electronic Stability Control, Heated Mirrors. OPTION PACKAGES ICONIC TRIM Space-Saver Spare, Transmission: 6-Speed STEPTRONIC Automatic, harman/kardon Premium Sound System, Active Driving Assistant, LED Headlights w/Cornering Lights, LED Fog Lights, Power-Folding Mirrors, Without Additional Chrome Interior Trim, SiriusXM Satellite Radio, 1 year All Access subscription, Chrome Line Exterior, Touchscreen Navigation Package, Remote Services, Advanced Real-Time Traffic Information, Apple CarPlay Compatibility, Wireless Charging, MINI Navigation, MINI Connected XL, Comfort Access Keyless Entry, Storage Package, Split Fold-Down-Rear Seat, Heated Front Seats, MINI Yours Leather Steering Wheel, Automatic Climate Control, Front Sport Seats, Auto-Dimming Interior & Exterior Mirrors, Wheels: 18 x 8.0 MINI Yours Masterpiece Style 524, Tires: 225/40R18, Power WHO WE ARE Bob Smith MINI is one of the premier MINI dealerships in the country. Our commitment to customer service at our MINI dealership serving Los Angeles is second to none. We have a full inventory of new MINI and pre-owned MINI cars, as well as a full inventory of pre-owned vehicles from a variety of makes. Be sure to check our inventory often as we are constantly getting new stock! Bob Smith MINI offers one of the most comprehensive MINI parts and service departments in the automotive industry. Horsepower calculations based on trim engine configuration. Fuel economy calculations based on original manufacturer data for trim engine configuration. Please confirm the accuracy of the included equipment by calling us prior to purchase. Moonroof, Heated Seats, STARLIGHT BLUE EDITION, Turbo Charged Engine, iPod/MP3 Input, Back-Up Camera. Cooper S trim, Starlight Blue Metallic exterior and Leather Lounge Satellite Grey interior. EPA 31 MPG Hwy/22 MPG City! CLICK ME! KEY FEATURES INCLUDE Back-Up Camera, Turbocharged, iPod/MP3 Input. Rear Spoiler, Steering Wheel Controls, Child Safety Locks, Heated Mirrors, Electronic Stability Control. OPTION PACKAGES STARLIGHT BLUE EDITION Silver Roof & Mirror Caps, Transmission: 6-Speed Steptronic Automatic, harman/kardon Premium Sound System, LED Headlights w/Cornering Lights, LED Fog Lights, Wheels: 17 Net Spoke Alloy, SiriusXM Satellite Radio, 1 year All Access subscription, Chrome Line Exterior, Touchscreen Navigation Package, Remote Services, Advanced Real-Time Traffic Information, Apple CarPlay Compatibility, MINI Assist eCall, Wireless Charging & Enhanced Bluetooth, MINI Navigation, MINI Connected XL, MINI TeleServices, Comfort Access Keyless Entry, Storage Package, Heated Front Seats, MINI Yours Leather Steering Wheel, Automatic Climate Control, Roof Rails, Piano Black Interior Surface, Headliner in Anthracite, Panoramic Moonroof. WHO WE ARE Bob Smith MINI is one of the premier MINI dealerships in the country. Our commitment to customer service at our MINI dealership serving Los Angeles is second to none. We have a full inventory of new MINI and pre-owned MINI cars, as well as a full inventory of pre-owned vehicles from a variety of makes. Be sure to check our inventory often as we are constantly getting new stock! Bob Smith MINI offers one of the most comprehensive MINI parts and service departments in the automotive industry. Horsepower calculations based on trim engine configuration. Fuel economy calculations based on original manufacturer data for trim engine configuration. Please confirm the accuracy of the included equipment by calling us prior to purchase. Moonroof, Heated Seats, STARLIGHT BLUE EDITION, Back-Up Camera, iPod/MP3 Input, Turbo Charged Engine. Starlight Blue Metallic exterior and Leather Lounge Satellite Grey interior, Cooper S trim. EPA 31 MPG Hwy/22 MPG City! CLICK NOW! KEY FEATURES INCLUDE Back-Up Camera, Turbocharged, iPod/MP3 Input Rear Spoiler, Steering Wheel Controls, Child Safety Locks, Heated Mirrors, Electronic Stability Control. OPTION PACKAGES STARLIGHT BLUE EDITION Silver Roof & Mirror Caps, Transmission: 6-Speed Steptronic Automatic, harman/kardon Premium Sound System, LED Headlights w/Cornering Lights, LED Fog Lights, Wheels: 17 Net Spoke Alloy, SiriusXM Satellite Radio, 1 year All Access subscription, Chrome Line Exterior, Touchscreen Navigation Package, Remote Services, Advanced Real-Time Traffic Information, Apple CarPlay Compatibility, MINI Assist eCall, Wireless Charging & Enhanced Bluetooth, MINI Navigation, MINI Connected XL, MINI TeleServices, Comfort Access Keyless Entry, Storage Package, Heated Front Seats, MINI Yours Leather Steering Wheel, Automatic Climate Control, Roof Rails, Piano Black Interior Surface, Headliner in Anthracite, Panoramic Moonroof. VISIT US TODAY Bob Smith MINI is one of the premier MINI dealerships in the country. Our commitment to customer service at our MINI dealership serving Los Angeles is second to none. We have a full inventory of new MINI and pre-owned MINI cars, as well as a full inventory of pre-owned vehicles from a variety of makes. Be sure to check our inventory often as we are constantly getting new stock! Bob Smith MINI offers one of the most comprehensive MINI parts and service departments in the automotive industry. Horsepower calculations based on trim engine configuration. Fuel economy calculations based on original manufacturer data for trim engine configuration. Please confirm the accuracy of the included equipment by calling us prior to purchase. Moonroof, Nav System, Heated Seats, Back-Up Camera, iPod/MP3 Input, SPLIT FOLD-DOWN-REAR SEAT. British Racing Green metallic exterior and Carbon Black Leatherette interior, Cooper S trim. FUEL EFFICIENT 31 MPG Hwy/22 MPG City! SEE MORE! KEY FEATURES INCLUDE Back-Up Camera, Turbocharged, iPod/MP3 Input Rear Spoiler, Child Safety Locks, Steering Wheel Controls, Heated Mirrors, Electronic Stability Control. OPTION PACKAGES SIGNATURE TRIM 6.5 Touchscreen Media System, Wheels: 17 x 7.5 Net Spoke Black Alloy Style 519, Transmission: Sport Automatic, Dynamic Damper Control, Heated Front Seats, MINI Driving Modes, Automatic Climate Control, Active Driving Assistant, Panoramic Moonroof, Piano Black Interior Surface, Comfort Access Keyless Entry, PREMIUM PACKAGE harman/kardon Premium Sound System, Auto-Dimming Interior & Exterior Mirrors, Power Front Seats, LED Headlights w/Cornering Lights, LED Fog Lights, Power-Folding Mirrors, SiriusXM Satellite Radio, 1 year All Access subscription, Chrome Line Exterior, TOUCHSCREEN NAVIGATION PACKAGE Remote Services, Advanced Real-Time Traffic Information, Apple CarPlay Compatibility, Wireless Charging, MINI Navigation, MINI Connected XL, JCW LEATHER STEERING WHEEL, UNIVERSAL GARAGE-DOOR OPENER OUR OFFERINGS Bob Smith MINI is one of the premier MINI dealerships in the country. Our commitment to customer service at our MINI dealership serving Los Angeles is second to none. We have a full inventory of new MINI and pre-owned MINI cars, as well as a full inventory of pre-owned vehicles from a variety of makes. Be sure to check our inventory often as we are constantly getting new stock! Bob Smith MINI offers one of the most comprehensive MINI parts and service departments in the automotive industry. Horsepower calculations based on trim engine configuration. Fuel economy calculations based on original manufacturer data for trim engine configuration. Please confirm the accuracy of the included equipment by calling us prior to purchase. Heated Seats, Sunroof, Back-Up Camera, iPod/MP3 Input, ALL-SEASON TIRES, SPLIT FOLD-DOWN-REAR SEAT. FUEL EFFICIENT 30 MPG Hwy/21 MPG City! Digital Blue Metallic exterior and Carbon Black Leatherette interior, Cooper S trim SEE MORE! KEY FEATURES INCLUDE All Wheel Drive, Back-Up Camera, Turbocharged, iPod/MP3 Input Rear Spoiler, MP3 Player, Steering Wheel Controls, Child Safety Locks, Electronic Stability Control. OPTION PACKAGES SIGNATURE TRIM 6.5 Touchscreen Media System, Wheels: 17 x 7.5 Net Spoke Black Alloy Style 519, Transmission: Sport Automatic, Dynamic Damper Control, Heated Front Seats, MINI Driving Modes, Automatic Climate Control, Active Driving Assistant, Panoramic Moonroof, Piano Black Interior Surface, Comfort Access Keyless Entry, PREMIUM PACKAGE harman/kardon Premium Sound System, Auto-Dimming Interior & Exterior Mirrors, Power Front Seats, LED Headlights w/Cornering Lights, LED Fog Lights, Power-Folding Mirrors, SiriusXM Satellite Radio, 1 year All Access subscription, Chrome Line Exterior, JCW LEATHER STEERING WHEEL, SPLIT FOLD-DOWN-REAR SEAT, ALL-SEASON TIRES. MINI Cooper S with Digital Blue Metallic exterior and Carbon Black Leatherette interior features a 4 Cylinder Engine with 189 HP at 5000 RPM*. VISIT US TODAY Bob Smith MINI is one of the premier MINI dealerships in the country. Our commitment to customer service at our MINI dealership serving Los Angeles is second to none. We have a full inventory of new MINI and pre-owned MINI cars, as well as a full inventory of pre-owned vehicles from a variety of makes. Be sure to check our inventory often as we are constantly getting new stock! Bob Smith MINI offers one of the most comprehensive MINI parts and service departments in the automotive industry. Horsepower calculations based on trim engine configuration. Fuel economy calculations based on original manufacturer data for trim engine configuration. Please confirm the accuracy of the included equipment by calling us prior to purchase. Moonroof, Heated Seats, iPod/MP3 Input, ICONIC TRIM, Back-Up Camera, Turbo Charged. Cooper S trim, Chili Red exterior and Lthr Cross Punch Carbon Black interior. EPA 31 MPG Hwy/22 MPG City! CLICK ME! KEY FEATURES INCLUDE Back-Up Camera, Turbocharged, iPod/MP3 Input. Rear Spoiler, Child Safety Locks, Steering Wheel Controls, Electronic Stability Control, Heated Mirrors. OPTION PACKAGES ICONIC TRIM Transmission: Sport Automatic, Active Driving Assistant, Power-Folding Mirrors, Without Additional Chrome Interior Trim, Touchscreen Navigation Package, Remote Services, Advanced Real-Time Traffic Information, Apple CarPlay Compatibility, Wireless Charging, MINI Navigation, MINI Connected XL, MINI Driving Modes, Automatic Climate Control, Auto-Dimming Interior & Exterior Mirrors, Wheels: 18 x 8.0 MINI Yours Masterpiece Style 524, Tires: 225/40R18, Power Front Seats, Piano Black Interior Surface, Space-Saver Spare, Dynamic Damper Control, harman/kardon Premium Sound System, LED Headlights w/Cornering Lights, LED Fog Lights, SiriusXM Satellite Radio, 1 year All Access subscription, Chrome Line Exterior, Comfort Access Keyless Entry, Storage Package, Split Fold-Down-Rear Seat. WHO WE ARE Bob Smith MINI is one of the premier MINI dealerships in the country. Our commitment to customer service at our MINI dealership serving Los Angeles is second to none. We have a full inventory of new MINI and pre-owned MINI cars, as well as a full inventory of pre-owned vehicles from a variety of makes. Be sure to check our inventory often as we are constantly getting new stock! Bob Smith MINI offers one of the most comprehensive MINI parts and service departments in the automotive industry. Horsepower calculations based on trim engine configuration. Fuel economy calculations based on original manufacturer data for trim engine configuration. Please confirm the accuracy of the included equipment by calling us prior to purchase.